I have been very fortunate to play here a number of times over the last few years. The whole set up is fabulous. The caddies are terrific, mainly because they mostly Scottish I would say (biased), the staff are great and so very well looked after. I always make the course look difficult, but then I make any course look difficult, but it is a test when the wind blows and the water looks ever so close. No houses to be seen at all. Just a tall block from a hotel I think is visible from the course and that is your line on the par 5!. 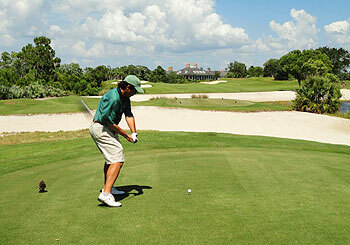 The greens are immaculate, always have been when I have played, and the fairways are excellent. The grass is Paspalum and makes for the rough to be kinder than other grasses. If you get a chance to play here grab it quickly, its a true gem and "pure golf"
Ufff, this was long ago!! I was lucky to play the course almost 4 years ago and it still remains fresh in my memory as it usually happens with courses that deserve it! I was in Miami and when invited to play, didnt hesitate in jumping into the car and patiently driving 2hrs alone to get there. I arrived with enough time to discover the most perfect maintenance barn I had ever seen (until I visited Pine Valley), learn a lot more about Paspalum and then have a small chat with the Superintendent to discover some secrets about why this course looks so perfect. We teed off after lunch and all I can say is that the course is a great piece of architecture, from begining to the end. No weak holes, every shot is needed and the risk reward ecuation stands perfect here. The greens rolled at 11 feet, only well hit shots would stop on the green and the resistance to score of the course is high, if you want to perform, you need to play the top of your game. After the game I learned more about the environmental culture of the Club and how they deal with native species, specially the 2 eagles they raised there. If you ever have the chance to play it, jump inside the car and drive!